Every one has a different style of learning. Hence, there are multiple ways to become a data scientist. You can learn from tutorials, blogs, books, hackathons, videos and what not! I personally like self paced learning aided by help from a community – it works best for me. What works best for you? If the answer to above question was class room / instructor led certifications, you should check out machine learning certifications and data science bootcamps. They offer a great way to learn and prepare you for the role and expectations from a data scientist. How can this article benefit you? 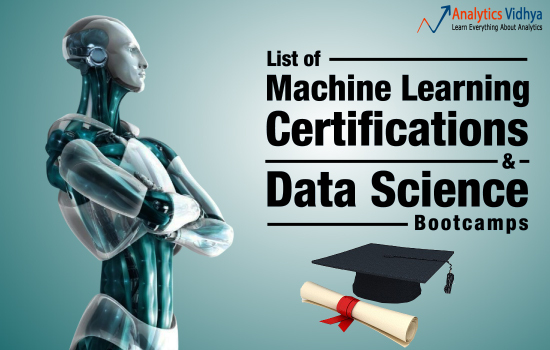 Global Machine Learning Certifications – This list highlights the widely recognized & renowned certifications in machine learning which can add significant weight to your candidature, thereby increasing your chances to grab a data scientist job. Data Science Bootcamps – You can think of bootcamps as online / offline classroom training which are held periodically. The motive of these bootcamps is to empower aspiring data scientists with necessary skills & knowledge highly sought by potential employers, in a short duration of time. These are like concentrated shots of learning consumed along with a bunch of fellow (aspiring) data scientists. Free Resources for Machine Learning – This list highlights the free course material available on machine learning & related concepts. Interesting part is, I have included some resources from the top universities of the world which are not so commonly mentioned, but can turn out to be great if you follow them seriously. Please note that this is simply a list of best certifications / bootcamps / resources. You should look at them as the best options available and choose what fits you the best. They are not ranked. This course is provided by University of Washington. It is available in dual (online / offline) format. This course provides hands-on experience of machine learning using open source tools such as R-Studio, scikit-learn, Weka etc. By the end of this course, you’re expected to gain the necessary knowledge required to fulfill business needs from a data scientist. This course is provided by Stanford Center for Professional Development. It is a graduation certification course which is to be completed in maximum of 3 years. This course is highly suited for candidates having a prior programming experience in C / C++. This course covers the essential modules of AI including logic, knowledge representation, probabilistic models & machine learning. This certification course is provided by Data Science Institute (Columbia University). This certification offers multiple courses such as algorithms for data science, probability and statistics, machine learning for data science, exploratory data analysis. This course is best suited for candidates having prior knowledge in programming, statistics, linear algebra, probability & calculus. This certification course is provided by Harvard Extension School. The methodology used in this course is via live web conference using blackboard collaboration. Generally, these classes are arranged on Fridays. This course will begin from 4th September 2015. This is a 15 week long course which covers every essential aspect of machine learning algorithms and precisely explains the logic underlying them. Udacity offers a comprehensive certification course on machine learning wherein the concepts are aptly explained using interactive practice videos. They have a unique style of explaining things, which might just work for you. The course duration is 4 months. This course closely covers the aspect of supervised, unsupervised & reinforcement learning using real life examples and problems. The principal motive of these boot camps is ensuring the structured acquisition of data science concepts & knowledge, thereby empowering the participants with necessary skills required by the recruiters. This concept of teaching has rapidly evolved in many countries. The primary reason being, the inability of people to stay focused on self-paced courses and follow every step as instructed. People now look for external support (teacher, mentor, instructor) to monitor their growth and development. Here I have highlighted the best of all boot camps being organized in the world. I’ve chosen these bootcamps on the basis of enrollment status, placement support, mentors / instructors, curriculum. This program provides dual ways of enrolling participants i.e. Data Science Cohort & Big Data and Hadoop cohort. The program aims to address the shortage of big data & data science talent in the industry. It provides job placement assistance within a salary range of $75 – $150k. The curriculum of both the courses is designed to focus on the essential aspects of data science & big data with a special focus on statistics and mathematics. This program offers dual career track such that the candidates enrolling this program have the option of choosing to become a data scientist or a data engineer. This program relishes an amazing support of industry stalwarts. The class size happens to be relatively small which allows the instructor to pay attention to every candidate. This program claims to train data scientists to tackle problems that really matter. This program is provided by University of Chicago. It teaches aspiring data science candidates to learn data mining, machine learning, big data and data science projects and work with non-profits, federal agencies and local governments and make a social impact. This program teaches you core skills which includes using math & programming skills to make sense out of large data, analyzing and manipulating data using python, fundamental modeling techniques to mention a few. The ultimate aim of this course is to empower students with appropriate knowledge required to make informed decision making at the workplace. This fellowship program intends to bridge the gap between academia and data science being practiced in the industry. This program receives the wide support of industry mentor and follow a pedagogy of project based learning. This course is FREE (you need to take placements through them – what else could you ask for!). The demand of data engineers has increased by 400% in the past 3 years. This fellowship program is designed to match the desired industry skills with skills acquired by candidates in academia. This course is FREE to enroll. The key features of this program includes in-person instructions from expert data scientists, career coaching & employment support. By the end of this project, candidates are expected to comfortably design, implement and communicate the results of data science projects creatively. This bootcamp provides the much needed acceleration to reach the next level in your data science career path. It teaches real world, practical skills to become a data scientist / data engineer. In addition, the participants also get job search support. This program claims to have a 360 degree view of data science industry needs, and accordingly design the curriculum so that participants can be the best fit for industry needs. This fellowship is highly applicable for people keen to start their career with startups. This program presumes that data science is more of a skill than just acquiring knowledge which needs to honed by continuous practice. Hence, the candidates attending this program will learn to build real machine learning applications and established data science teams. The fellowship program enables you to jumpstart your career in data science. This program is widely supported by industry leaders such as foursquare, the new york times, capital one, microsoft, ebay etc. This program is focused on providing training that links your analytical skills to job opportunities. In this bootcamp, you’ll undergo a structured curriculum which covers the essential aspects of data science. Participants are given real industry problems for practicing data science techniques. The statistics at Zipfian website claims to have 93% placement, $115 average salary in less than 6 months. They also run a 6 week data fellowship. Here you’ll also find resources from the top universities teaching machine learning including cornell, MIT, harvard, carnegie universities. These are self-paced tutorials which includes slides, videos, blogs and what not! These resources are in no order. 1. Machine Learning course by Yaser Abu Mostafa – This is one of the highly recommended course on Machine Learning. Usually, this course is provided on edX, but it has been closed now. It is expected to run again in 2017. You can still check out the course content and learn from them. 2. Machine Learning (Andrew Ng) on Coursera – This course requires no further introduction. If you are in data science, chances are you already know of this course. One of the best course on machine learning for beginners by Andrew Ng. It starts by covering linear regression and progresses towards higher level algorithms. This course is available for FREE! 3. Probabilistic Graphical Models – This course is provided by Stanford University on Coursera. The course instructor is Daphne Koller (co-founder of Coursera). This course teaches you the basics of PGM representation, methods of construction using machine learning techniques. 4. Neural Networks for Machine Learning – This course is provided by University of Toronto on Coursera. The course instructor is Geoffrey Hinton. This course will make you familiar with the applications of machine learning such as artificial intelligence, image recognition, speech recognition, human motion and how they are being used. In this course, Geoff has beautifully explained the basic algorithms & practical tricks to get machine learning working. 5. Scalable Machine Learning – This course is provided by University of California on edX. This course allows you to learn underlying statistical and algorithmic principles required to develop machine learning pipelines, implementation of scalable algorithms for fundamental statistical models, hands-on experience on Apache Spark. 6. Machine Learning Tutorials – Carnegie Mellon University – Carnegie Mellon University is widely known for its machine learning department. This resource provides tutorial videos & slides from the class of 2011. It consist of Andrew Moore’s tutorials as well. This tutorial focuses on explaining the concepts of supervised, unsupervised and reinforcement learning by building models. 7. Machine Learning Quick Tutorials – Cornell University – Here’s the course material of Fall 2014 in Cornell University. This tutorial attempts to teach machine learning from the scratch using some interesting presentations. This course covers almost all the modules of machine learning. If you think you can’t watch videos to learn these concepts, checking out these presentations should do good for you! 8. MIT Open Course on Machine Learning – This course is provided by Massachusetts Institute of Technology. If I am not wrong, this course has been archived but you can still access the course material. This tutorial aims to cover the underlying machine learning algorithms, starting from Regression, Classification till higher level concepts such as bayesian networks, collaborative filtering etc. It is available for download in PDF version. 9. Machine Learning Algorithms Tutorial by Andrew Moore – Andrew Moore is the Dean of the School of Computer Science at Carnegie Mellon University. Here are the set of tutorials which covers many aspects of statistical data mining, classical machine learning, foundation of probability to mention a few. These tutorials are available to download in PDF version. I’d highly recommended beginners to follow this tutorial. 10. CSCI E-181 Machine Learning: This course is provided by Harvard Extension School. It consists of video lectures which are focused on machine learning algorithm. Since, not everyone is fortunate enough to get into Harvard, you surely shouldn’t miss the erudite discussions and knowledge being disseminated by Harvard professors in these tutorials. I really admired the pedagogy used by professors in these tutorials. 11. CSCI E-109 Data Science: This course is also provided by Harvard Extension School. I believe these are one of the best video tutorial available on learning data science in Python. The course instructor has beautifully explained such strenuous concepts using interesting examples and viewpoints. I’d recommend beginners to take this course as it covers every underlying aspect of data science and machine learning. In this article, I have strived to provide you the best possible information on machine learning certifications and data science bootcamps. While creating this article, I realized there are more than 20 bootcamps being organized across the world, but later I decided to highlight the best ones in this article. If you’ve attended any bootcamp and got benefited, please share your review below. Some of the tutorials mentioned provide a high level overview of machine learning, hence if you wish to start from the scratch, you should start machine learning now. Did you find this article useful? Did I miss out something? I’ll be happy to hear from you in the comments section below. Excellent Kunal and Team. The information you are giving to the analytical society is worth million times. Thank you.. There was no mention of online bootcamps. The bootcamps mentioned were at a location. This website is Google for Analytics. So precise yet so informative. While it may not provide as detailed an analysis of the Machine Learning algorithms, I would also recommend The Analytics Edge offered by MIT on edX. This course covers running the algorithms in R and we even had a private Kaggle competition that contributed toward our final grade. I don’t know if the class has been archived or when it might be offered again, but this was one of the best courses I have taken online. The Analytics edge covers linear and logistic regression, trees (random forest and cart) and unsupervised ML such as PCA, k-means and hierarchical clustering. Why do you say “does not feature machine learning modules”. Is that to mean they do not cover the theory in detail and they use R packages rather than letting students write their own codes as Andrew’s ML course? I personally believe the Analytics Edge is much better than Practical Machine Learning course from coursera. I am in the 2 year certificate program (4 courses). The costs are much lower than comparable programs ($~6K). Thank you Harvey for sharing this useful information. how is this course?Is it in online mode?I am from India. So is there any criteria for this course? There is also a weekend course called post graduate diploma in data science conducted at St. Xavier’s college , Mumbai which approved by UGC conducted in association with Sankhya Analytics. The course focuses on predictive analysis and also machine learning with R.
I’m surprised you don’t have the Data Science specialization from Johns Hopkins on Coursera. It’s nine classes including a capstone project. Independent Coursework This way, you show that you took the time to learn something for yourself when you re not working, lend Coursera credit, and borrow the brand name of the great universities there. Hope this helps. I am halfway through the classes on dataquest.io and love them. First few are free and the rest are accessible for 50/month. Great website. P.S – Let me check out this course now. Excellent work in providing information to the Analytics community.One of the best websites for Analytics related stuff. What about de Data Science Specialization of Johns Hopkins University with Coursera? I Think you have missed a course from IIT Madras. It is a online certification Course through NPTEL called “Introduction to Machine Learning” conducted by IIT Madras Professor Dr. Balaraman Ravindran. (link 1 : http://nptel.ac.in/syllabus/106106139/)(link 2: https://onlinecourses.nptel.ac.in/noc16_cs03/preview). Hope this will be also useful viewers. Thanks for Sharing This Amazing Content.